We’ve said it once and we will say it again: picking the right place to eat or drink in Prague’s historical centre can be tricky. The thing is, most of the venues in the areas exposed to tourism are not really frequented by the locals and you have to cherry-pick them to find the good, authentic local spots. Prague can get very touristy at times. Just wait until you get here and you'll see what we’re talking about. Luckily, there are a few places in the centre that are exceptions to the rule. One of them is the Dlouha street. Just a few steps off the madness that is the Old Town Square, with the Astronomical Clock that the locals are careful to avoid around the full hour (if you’ve been to Prague, you'll understand), the Dlouha street is a refuge that offers some great places to eat, meet and greet with the locals. Tob e perfectly honest, we spend most of our days there, anyway! If you are in the Old Town area, you can spend nearly the entire day in the Dlouha street and its surroundings eating, drinking and even enjoying some culture and walks. Don’t believe us? Here are some of the options. You can start the day with a hearty breakfast at three places that are literally just a few steps of each other. Heck, they even share the same address: Dlouha 39. Bottega Bistroteka is a member of Riccardo Lucque’s chain of Italian Bottega bistros that focus on simple but high-quality Italian dishes and pride themselves of their great modern design. Come here if you like egg-based breakfasts like our favorite Eggs Benedict. Their version is very nice. Also, don’t forget to have a look at their salad bar - the salads, which are clearly inspired by Yotam Ottolenghi’s recipes, are very, very nice. We wouldn’t be surprised if you came back for lunch later on. If you demand meat for breakfast (and we can’t blame you), start the day with the breakfast of true champions: the trio of hot dogs over at the Nase maso butcher shop next door never fails to satisfy. If starting your busy day with hot dogs is wrong, we don’t want to be right. The morning is a great time to visit the butcher shop, which can get incredibly crowded later on during the day. Also, don't forget to check out their second shop in the arcade with their own Czech classic hot dogs. Finally, just walk across the hall to have your morning fix of chlebicky, i.e. traditional Czech open-faced sandwiches, at Sisters. Nothing wrong with that for breakfast, especially when combined with the Czech sweet buns they sometimes offer. They can also make one nice cappuccino on a good day. Having been fed, it’s time to kick it up a notch in the Dlouha gourmet passage, opened in early 2014. Three notable venues can satisfy your post-breakfast appetite: the Mam rad syr cheese shop behind the Nase maso shop can fix you a cheese board if you haven’t had enough food for breakfast. Also, we’re pretty sure that it’s five o’clock somewhere, so a glass of good Italian natural wine from Via del vino across the hall won’t hurt, either. We know that Bogdan Trojak of the Veltlin wine bar likes to visit to take a few bottles home from this little shop owned by Flemming, originally from Denmark, who's a connossieur of Italian wines and a very nice person on top of that. Finally, is it too early to have a bowl of pho at Banh mi makers? Well, it's a breakfast dish back in Vietnam, so we guess it's not. Anyway, now that you’re well fed, you could use a small walk… and a bit of culture. Walking into the Hastalska street past the Chatty fashion designers (they’ll be still closed in the morning, but you can come back later on) and the Pernickuv sen shop that is the stuff gingerbread dreams (or nightmares, depending on which side of the cliche barricade you stand) are made of, you’ll reach onesip coffee, the place where we get most of our coffeine fix every single day. Adam and Zdenek, the two baristas, have opened the tiny espresso bar recently, but it has become one of best coffee shops in Prague, and the place to go to for many Prague's best baristas, including Ondra Hurtik, the Czech Barista Champion among others. Continue on to Hastalske namesti square, where we actually start our Prague food tours nearly every day. Turn right to get behind the church and reach the St Agnes Convent, one of the most beautiful, and one of the most underrated, sights in Prague. Do yourself a favor and visit the National Gallery’s beautifully arranged and well-curated collection of Medieval arts inside. We’d recommend that you actually follow into the Stinadla area west of the St Agnes Convent, an tiny area with small, shady streets that are tourism-free and radiate a sense of mystery. (Maybe it’s the series of Czech books for young adults that associated this area with a secret brotherhood.) Have a walk around - it won’t take more than five, ten minutes. Because then it’s time for shopping. 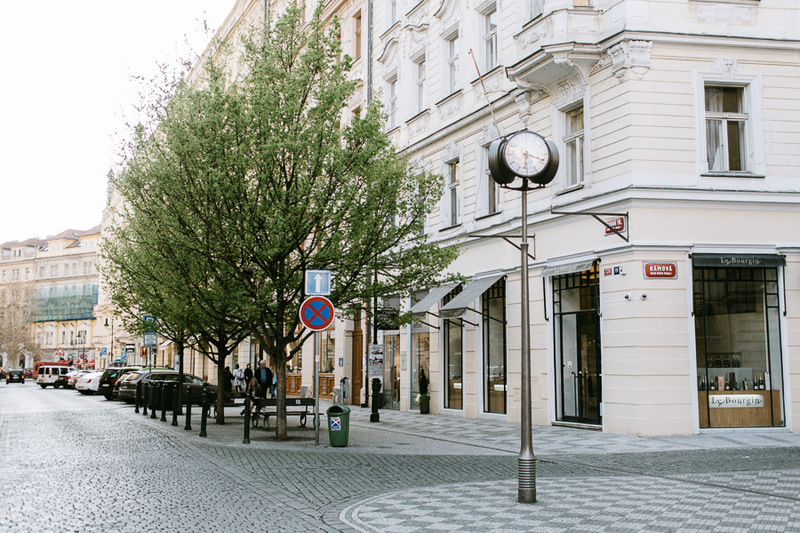 Head over to Kozi place square and treat yourself to a nice bouquet or just a small flower into your hair or button in Metamorphosis, the most beautiful flower shop in central Prague. Continue into the Ramova street and have a look at some local and foreign fashion designers over at Space Praga, or see what you could have brought home if you had much more cash on you, a much bigger luggage and a huge roll of bubble wrap at the Qubus + Bomma shop that sells unique glass pieces by young the most famous local designers. But now you’re hungry again. Or at least let’s pretend you are. There are a few very good options for that. First, the Lokal pub serves classic Czech comfort food with some of the freshest Pilsner beer you’ve ever tasted. Our secret tip is the schnitzel with potato salad. (Actually, the secret tip is that they serve great pastries by Cafe Savoy… at cheaper prices than at the Savoy, so just power through the awkward feeling that you’re eating pastries in a beer hall, and just order some.) Alternatively, you can insert a bit of Bangkok into your Prague vacation in the Long Street Food Thai bistro a block away. The newly opened Banh-mi-ba is another great option for a quick and inexpensive lunch: Vietnamese banh mi sandwiches, bun bo nam bo or bun cha, all wrapped in a pleasant, slightly hipster environment that is minimalist and cool at the same time. You’ve had lots of food by now. It’s time to digest and focus on something other than food. First, you can see some great local and foreign modern artists at the Dvorak Sec Gallery. Follow on with some shopping for fashion: Timoure et Group, Tatiana and Klara Nademlynska boutiques are all within a one-minute walk from the gallery and all offer nice, modern apparel for nice, modern women. We know you had food already, but Le Bourgin right next to Long Street Food sells wonderful French wines, “terroir” olive oils, pates and the like. You know, things you can pack easily and take home. You can find similar canned goods, along with breads, cheeses, hams, vegetables and fruits at the Dlouha 14 shop at Masna street with the Rybarna fish shop next door. Now the time is high for a nice, romantic dinner. In the fine dining department, the options around the Dlouha street are nearly limitless. By which we really mean there are four legit fine dining establishments nearby. La Degustation, of course, is the best restaurant in the country and one of the three Michelin stars in Prague. Come here for the six-course or eleven-course tasting menu designed for adventurous foodies. The Field restaurant, also awarded a Michelin star, is only second best to La Degu when it comes to Czech food. They also offer a tasting menu but why? This is La Degustation’s territory and we’d rather go for the a-la-carte selection. The flavors are great and the modern and airy room makes for a relaxed evening. And if you want to have a classic French dinner, Kalina or Pot-au-feu will both serve you well. Both do classic French dishes (we hope you like butter and truffles) and have nice selections of wine. The Kalina is a bit fancier than the understated and smaller Pot-au-feu, but we actually slightly prefer the latter over the former. Finally, if sushi is your thing, there are two options for you. The fairly new Yoshihashi Sushi in the Ramova street serves great sushi in a setting that we would associate with Japan: bare walls and simple tables with a designer touch. And the dishes we tasted were great. Yami nearby is the polar opposite: colorful, loud and fun, and the sushi sets are huge and well priced. We would go to the former with a date, and to the latter with a family or friends. Now that you’ve been dined and wined, it is time to have some fun! If you're in for some additional wining, Bokovka, a beautiful wine bar in a former 1500s brewery, is one of our favorite wine bars in town, with a big focus on natural wines, wonderful cheese boards and fancy sardines. Located in a courtyard and without proper signage, this is a true hidden gem and a place you could be returning to every night. For a bit of dancing, there’s always the Roxy club next to the Lokal pub. We haven’t been in ages (yes, we’re getting older) but it’s still one of the most popular clubs in town. For cocktails, we would head over to L’Fleur, a newcomer to the high-end mixology scene in Prague that has quickly become one of our favorite bars in Prague. A great selection of high-end Champagnes and their signature twists on classic cocktails had us sold after the first visit. Another option is Public Interest, a bautiful bar right next to Field. And to finish the day off? Burrito Loco at Masna, just next to Kolonial and Rybarna fish shop. Shh, you’re okay. We won’t tell. Prague Foodie Map (2nd edition) out now! Where to stay in Prague? Older PostCommon mistakes when traveling to Prague, a.k.a. "It's your own fault"